The finds were made during a preliminary examination of the site in June 2010. More extensive excavations are due to take place in 2011. The leader of the project, Dr George Nash, said they had already made important progress. 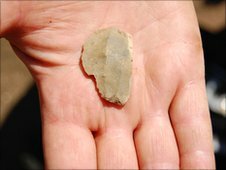 He said: "We've found some quite significant archaeology. We've started to find structures that come away from the main gallery grave and we also have artefacts. "So far the results have been quite spectacular." The Delancey Park structure is Guernsey's only gallery grave, while there are two to be found in Jersey and more along the Atlantic coast of northern Europe. Gallery graves belong to the late Neolithic period and are therefore more recently built than the more prevalent 'passage' graves, such as Les Fouillages and Dehus in the Vale. Dr Nash explained: "The earlier constructions feature passages leading to an inner space, often with partitioned areas that may denote 'engendering' - the separate burial of males and females. "The gallery grave consists of one narrow space of up to 20 metres, flanked by lines of stones outside the main construction. "These delineate the revered space around the gallery from the ordinary ground beyond." 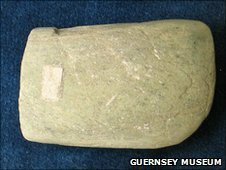 The most significant object found on the site during earlier digs was the head of a greenstone axe. It was fashioned from a soft rock and highly polished, perhaps indicating it was a decorative item rather than utilised as a tool. The first dig at the site in 1919 was controversial. Some parishioners felt the unearthing of a grave site for scientific research was inappropriate. 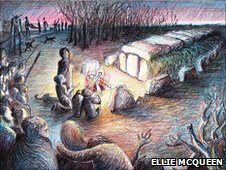 A landslip at the nearby Longue Hougue quarry later that year, which led to a loss of life, was thought by some to have been a consequence of disturbing the spirits residing in the ancient site. Dr Nash stressed the advantages of modern archaeological techniques compared to the methods used during previous digs. "If you look at the photographs of the 1932 excavation, it's very much a sort of dig and prod exercise where they didn't actually remove the stones." 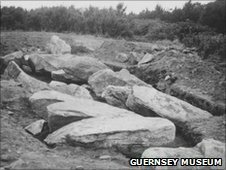 Guernsey's archaeology officer Philip De Jersey explained the need to disturb the late Stone Age site for a third time. He said: "It's suffered quite badly, particularly in the early twentieth century and it would be a shame to lose any hope of getting what information out of it we can." 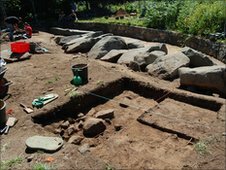 The team visiting Guernsey for the dig is from the Clifton Antiquarian Club. It includes several professional archaeologists. Their work is funded by the Admiral de Saumarez Trust, a charitable organization which raises money for community and island-wide regeneration projects, such as the rejuvenation of sports amenities and historical features at Delancey Park. The discoveries made during June 2010 prompted Dr Nash and his team to plan to return in 2011 for more extensive research. He said this would include lifting some of the enormous stones in order to search for further clues beneath.